Stretch Out! Our rooms are spacious enough for families of 5. 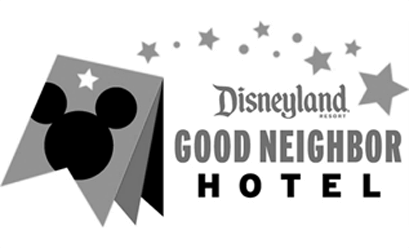 And nowhere else next door to the Disneyland® Resort offers FREE WiFi Access, FREE parking, FREE in-room safe and premium Keurig coffee makers. We have rooms to fit families of all sizes and budgets. Just select a room type below to find out more. Located on the top floor of building one you’ll be sure to see the best views Disneyland® Park from one of the two balconies. This pirate-themed room has one king bed in the separate bedroom and a queen size, comfortable sofa sleeper in the living room. Kids young and old can play together on the Xbox Kinect Disneyland® game right in your spacious living room. When you need some space and convenience, our ADA accessible king room is a great option! These rooms are located in Building #3, and have an option for connecting with an adjacent NDD1 double room. Close to the front desk, it is short distance to get to on our 7-acre property. These spacious rooms provide plenty of room to be comfortable for up to 5 persons with an extra roll-away bed (extra fee). Our two, full-extra-long, Dreamscape pillow-top mattresses will leave you missing Hojo. Located in our four Pavilion buildings, these rooms give you the perfect distance to the pool and water playground. Our Deluxe City View, newly renovated, super-sized, themed rooms offer two Dreamscape, pillow-top queen beds in our Building #1 Tower. Located on the city side of the building, we’ve added additional soundproofing for a refreshing sleep, convenient dining table and family-friendly touches. Enjoy amazing, panoramic views of the Disneyland® Resort directly from the balcony of this premium, two queen bed room! Located in our newly renovated Building #1, you will experience thoughtful touches from stem to stern. With Dreamscape pillow top mattresses, themed-artwork, convenient dining table and family-friendly touches, we’ve created the perfect vacation room. This 538 square foot two-room suite in Building #1 sleeps up to six people, making it the perfect room for families with kids. Featuring two separate bedroom and bathrooms, parents can relax in a spacious king bedroom with the kids in a separate room featuring a twin bunk-bed and deluxe double, pull-out sofa sleeper. This Pirate Suite comes with Pirate Attraction themed artwork throughout, so all of your little buccaneers can enjoy the Pirate’s Life from our Castaway Cove Water Playground to their pirate-y room. Featuring wider doorways, larger bathroom and a twin bunk bed, our ADA accessible queen/bunk bed room is a great option! With plenty of space to navigate, this is the perfect room for those needing accessibility options while traveling with young kids. Located in Building #2, this 700 square foot suite is one of our largest suites, and will comfortably sleep up to 6 people. Equipped with two Dreamscape pillow-top, queen beds in one room and a full-size sofa sleeper and sitting area in the other room, this room is perfect for all of your vacation needs. Featuring two balconies, this room provides views overlooking our beautiful Garden Pool!